Starting our sightseeing tour in Innsbruck, we will first experience a guided city tour through the tyrolean capital city, discovering its main tourist attractions. 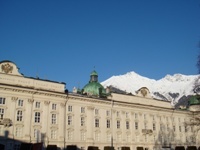 You will visit the Bergisel mountain with its world famous Ski Jump Stadium, follow a guided city walk in the narrow streets of Innsbruck's old town including a glance at the "Golden roof", the imperial palace and the imperial chapel of Innsbruck, the Innsbruck cathedral and other interesting monuments. Next, we will travel to the romantic city of Hall in Tyrol, where we have a look at the Hasegg castle with its magnificent tower. After a short break for lunch, we move on to Wattens and visit the Swarovski Crystal World museum which is today the most popular tourist attraction in Tyrol. Finally, your English speaking tour guide will take you on a driven sightseeing tour of the Alpbach valley with its characteristic tyrolean houses and its abundand flower decoration. On our way back to Innsbruck, we will make one last stop at the city of Rattenberg and visit the glass manufacturer Kisslinger. You are visiting the English section of the Innsbruck Tours website. Below this text, you will find links to important technical information. On the outer right rim of the page, you may choose between different popular sightseeing excursions to and from Innsbruck by car, minibus and coach. To get information in a different language than English please click on the respective country flag.